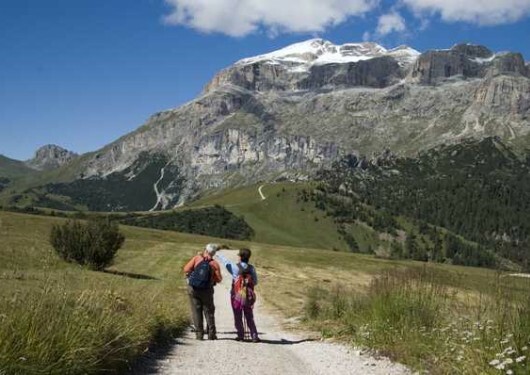 The “Teriol Retic de” (trail Retiz) is part of the thematic routes “Terioi of Fodom” and is a lovely walk, passing through some beautiful environments of the Ladin area Livinallongo and will surprise you with beautiful natural vistas. Advisable to start the course of Pieve di Livinallongo, where you can leave the car in the public parking available near the church. You can go to the church to take a view of the valley and the small chapel behind the church. Then continues on the path towards the village of Brenta and just before you reach the gas station “Shell”, turn left and take the path that leads through a steep meadow. After a short walk from Col (Colsottochiesa), a fraction consisting of 3 buildings and on to the paved road Retiz. From here you have a beautiful landscape of Mount Civetta at sunset, this is particularly impressive. Worth a stop the waterfall of Retiz is surrounded by rock walls, demonstrating the most important aspects of the geological development of the valley. You will then come to the hamlet of Foppa and from here, turn left and take a small path that goes through a little wood and leads back to Pieve. In the last climb, you can enjoy a wonderful view.